Other non-digital voice modes such as amplitude modulation, frequency modulation, and single sideband have been widely used since the first half of the 20th century. By comparison, digital D-STAR signals offer clearer signals and use less bandwidth than their non-digital counterparts. As long as the signal strength is above a minimum threshold, and no multi-path is occurring, the quality of the data received is better than an analog signal at the same strength. The first manufacturer to offer D-STAR compatible radios is Icom. As of February 1, 2013, no other amateur radio equipment manufacturer has chosen to include D-STAR technology in their radios. The technology requires the use of a proprietary AMBE Codecthat is owned by Digital Voice Systems, Inc.
D-STAR transfers both voice and data via digital encoding over the 2 m (VHF), 70 cm (UHF), and 23 cm (1.2 GHz) amateur radio bands. There is also an interlinking radio system for creating links between systems in a local area on 10 GHz, which is valuable to allow emergency communications oriented networks to continue to link in the event of internet access failure or overload. In addition to DV mode, a high speed Digital Data (DD) mode can be sent at 128 kbit/s only on the 23 cm band. A higher-rate proprietary data protocol, currently believed to be much like ATM, is used in the 10 GHz "link" radios for site-to-site links. In 1999 an investigation was put into finding a new way of bringing digital technology to amateur radio. The process was funded by the Japanese government and administered by the Japan Amateur Radio League. 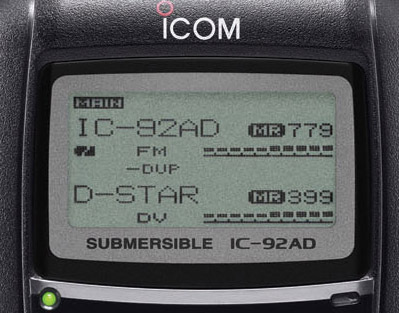 In 2001, D-STAR was published as the result of the research and Icom entered the construction of the new digital technology by offering the hardware necessary to create this technology. In September 2003 Icom named Matt Yellen, KB7TSE (now K7DN), to lead its US D-STAR development program. 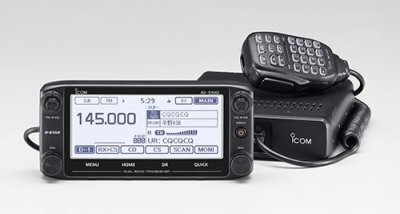 Starting in April 2004 Icom began releasing new "D-STAR optional" hardware. The first to be released commercially was a 2-meter mobile unit designated IC-2200H. Icom followed up with 2 meter and 440 MHz handheld transceivers the next year. However, the yet to be released UT-118 add-on card was required for these radios to operate in D-STAR mode. 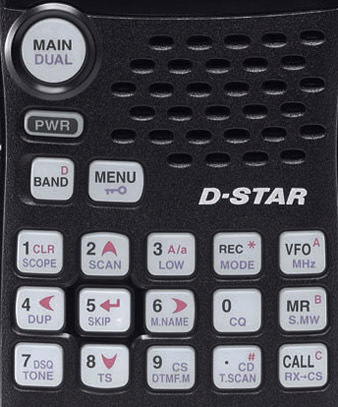 Eventually Icom began selling the card and once installed into the radios it provided D-STAR connectivity for each of the transceivers. The June 2005 edition of the ARRL's QST magazine reviewed the Icom IC-V82. JARL released significant changes to the existing D-STAR standard in late 2004. Icom, aware that the changes were coming, had placed the release of their hardware on hold for a period of as much as a year while they awaited the changes. As soon as the changes were out, Icom announced they would be able to finish up and release equipment. The Icom ID-1 1.2 GHz mobile radio was released in late 2004. 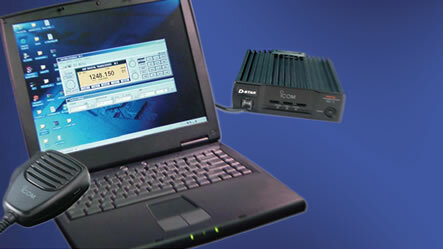 The ID-1 was the first and so far only D-STAR radio that provides digital data (DD) mode operation. In this mode data via TCP/IP can be transferred at 128 kbit/s. The first D-STAR over satellite QSO occurred between Michael, N3UC, FM-18 in Haymarket, Virginia and Robin, AA4RC, EM-73 in Atlanta, Georgia while working AMSAT's AO-27 microsatellite (Miniaturized satellite) in 2007. The two operators used a variety of Icom gear to make the contact and experienced slight difficulty with doppler shift during the QSO. 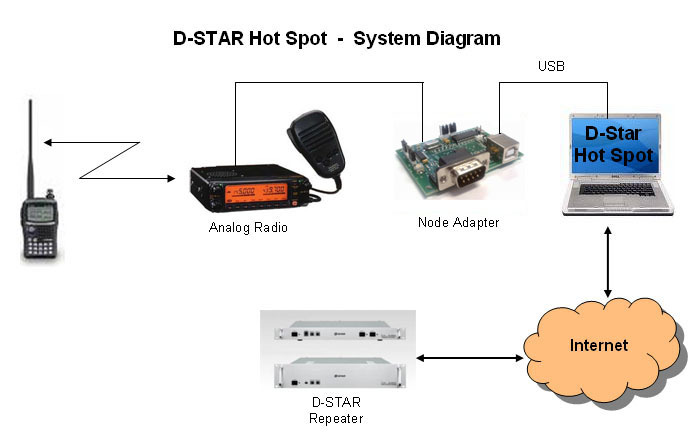 As of late 2009 there are around 10,800 D-STAR users talking through D-STAR repeaters which have connectivity to the Internet via the G2 Gateway. There are around 550 G2 enabled repeaters now active. Note, these numbers do not include the scores of users with D-STAR capabilities but not within range of a repeater, or working through D-STAR repeaters that do not have Internet connectivity. The first D-STAR capable microsatellite was scheduled for launch during early 2012. OUFTI-1 is a CubeSat and is built by Belgian students at the University of Liège and I.S.I.L (Haute École de la Province de Liège). The name is an acronym for Orbital Utility For Telecommunication Innovation. The goal of the project is to develop experience in the different aspects of satellite design and operation. The satellite weighs just 1 kilogram and will utilize a UHF uplink and a VHF downlink. Run only DSTAR nowadays and it will be with my Id 31 and Id880H. And I use my FWSIs and my DVRPTR V1 as my local hotspot. Is just me running DSTAR in Lidköping so there are no repeaters that I can use at close range. Hope later this spring that I'll get off my FWSIs and rasperry pi so that I can be QRV on DSTAR from the car. Finished with hf because the neighbors did not like my hf antennas. So I found mostly on REF001C and REF030C and so I tend to cry a little sporadic CQ on the other reflectorerna. Is also running on the DCS reflectoerna and run some qso in between. Have been running the D-star since February 2012. First, I start with my ID880H and my DVAP , which I bought from Mark at HRO in Atlanta. And drove many fine qso with stations around the world. And then it was on the old Reflectorers. And in July 2012, I start driving with my DVRPTR from Germany Version number 1. 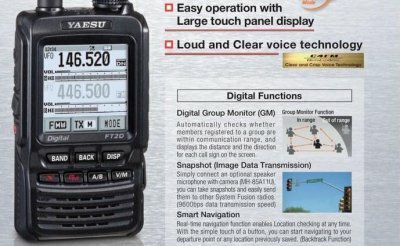 I connected it with my Yaesu 897 and have run it at 70cm without problems. And has a range of around 10km. So I can run the mobile around Lidköping. And now we are waiting DVRPTR Version 3 comes out in October 2013 for sales. Have been running hard and driven many fine qso with stations around the world and got to know many nice radio amateurs. Here was the little pictures of different Dstar stuff. And DSTAR are the best things that happened in amateur radio for many years, I think. I saw a post for this amazing looking product on the Rasberry Pi D-Star Group. I'm always encouraged when I see development for third party D-Star hardware. 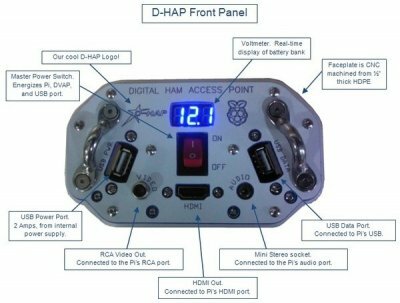 What you see here is the D-HAP (D-Star Ham Access Point) designed and built by Hardened Power Systems who are well known for their portable battery power systems. The D-HAP is a small, rugged, self contained enclosure/power supply for a Raspberry Pi and DVAP Dongle. Watch this short YouTube video that describes the development of the D-HAP, how the internal components are laid out and it's features. For what you get, I think it is well worth the money. 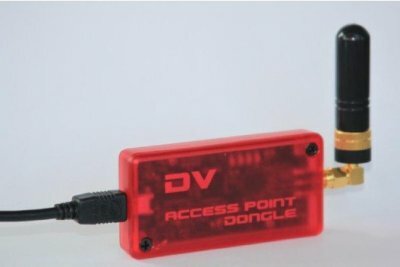 If you already have a Raspberry Pi and DVAP Dongle the D-HAP will provide a rugged, all-in-one solution for a D-Star HotSpot, complete with built in battery! All you need to do is provide an internet connection. Here is a link to the Hardened Power Systems D-HAP web page. ICOM will release 144&430MHz FM&DV transceiver. Late Feb 2014. If you have an ICOM D-Star radio but are not near a D-Star repeater, a Hotspot allows your radio to access DPlus-connected DStar repeaters and reflectors. Or you may just want to control how and where you link to other repeaters/reflectors, without disturbing other users of a nearby D-Star repeater. All you need is an analog radio that has a 9600 data port, or gives access to the FM discriminator and modulator. I put up the Hotspot because I already had a spare analog radio with Data port, as well as a spare laptop, so this option was incrementally less expensive than the popular DV Access Point or DVAP. In addition, I set my analog radio to 5 watts, giving me somewhat more range. A simplex (one radio) Hotspot can later be converted to a full duplex repeater, which I did a year later. There are several GMSK modem boards available, and reports on the internet indicate they all are good choices. Be sure to subscribe to the gmsk_dv_node Yahoo Group for information and help with Hotspots. Here is how I set up and configured my Mini Hotspot. There's nothing new here -- it was all learned from the primary documentation available. This just assembles what I did in one place in case I or others need to do the same thing again. I will do my best to keep this up to date as new boards and software come out, but if you see that I'm missing something, please let me know. A GMSK Modem or GMSK Node Adapter board, sometimes also called a Mini Hot Spot. [Full disclosure: My first board was the NQSMHS from Mark Phillips. Worked great. I also have a DUTCH*Star HSA board, also excellent. I had the use of a Satoshi V7 board for a week, and it proved to work well also. I have also gotten into the business of distributing digital voice equipment, and my company markets the Star*Board from Matrix Circuits. Obviously I'm partial to that one, but I can honestly say all the boards listed here will do the job well.] The main sources are listed below -- I will only list vendors who sell boards for which there is firmware which the author will support on that board. Firmware for the MHS board. Some boards come with the firmware loaded already, otherwise you'll need to load it yourself. An analog FM transceiver (any brand) with access to the discriminator and without filtering of the transmitted audio. Typically radios with a 9600 bps Data port will work without modification. 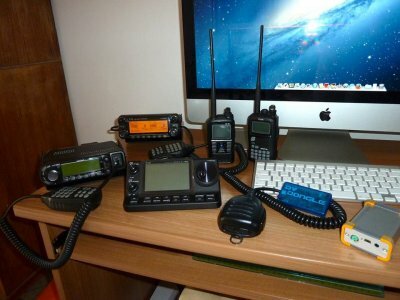 I have used a Kenwood TM-D700A and a Yaesu FT-817ND, but many others are in hotspot service. A USB cable. Different boards use different connectors, so check the board's manual. The NQSMHS and Star*Board use type A male to type B male. These are easy to find. I had a spare in the closet. A radio cable. Again, different boards use different connectors, so check your User Manual. Most boards use a 9-pin DSub Female connector. The other end plugs into your radio's 9600 data port and typically is a 6-pin mini DIN. The V7 board expects a male 6-pin mini DIN. Pre-made cables are often sold by the board vendors. If you'd prefer to build your own DSub cable, click here for build instructions. Gateway Software. 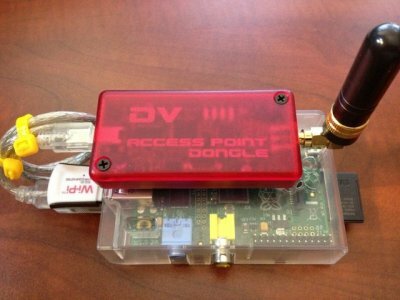 I recommend any of the three popular hotspot applications: KB9KHM's DVAR Hot Spot, PA4YBR's WinDV and G4KLX's GMSKRepeater/ircDDBGateway. All run under Windows XP or higher, and the G4KLX programs can also be compiled for Linux. Step 1 - registers the Hotspot callsigns on the DStar network. Step 2 - installs tools used to configure and test the hotspot board, and for Windows XP, a special USB driver that's needed. Step 3 - sets jumpers and optionally loads firmware onto the MHS board's computer chip. Step 4 - configures and tests the board using NAWinCFG and NAWinTEST. Step 5 - installs and configures your hotspot software (DVAR Hotspot, WinDV or G4KLX's Repeater and ircDDBGateway). You need to register at least one "terminal-id" at a D-Star repeater. Depending on how you decide to configure your Hotspot, you may need to register up to three terminal-ids. While the following terms won't make sense until you've made it through Step 5 of this document, I'll lay the rules out here. Note that what most of us call "Band Module" or "Port" is called "initial" on the registration screens. Node Callsign with Band Module/initial must be registered as a terminal. If you call your Hotspot K1ABC with Band Module C, then "K1ABC C" must be registered as a terminal. The MyCall in your D-Star HT or other radio must be registered. Usually people use their callsign with a blank band module. Use your callsign with blank band module/initial for MyCall. Use the same (callsign with blank) for Hotspot software's Gateway Auth Callsign/AuthCall. Use callsign with Band Module B or C for Hotspot software. Whatever you use, each one must be a registered terminal-id. 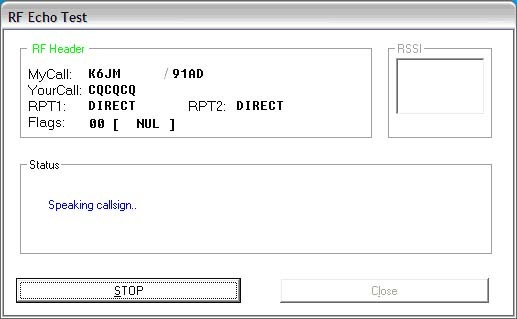 Since it can take up to 24 hours for a callsign to propagate through the network, try to do this step before your board is ready for use. Registration is a two step process. If you've never registered, read D-Star Self Registration Instructions and perform steps 1 through 6 of that document. Go to the Registration page of the D-Star repeater closest to you. Typically, if that repeater is KA6XXX, then it will have a DPlus Dashboard page (at http://ka6xxx.dstargateway.org/) with a link to its Registration page. When you receive the confirmation email, you can proceed. Log on using your callsign (upper case) and password. Click on the Personal Information tab (upper right of the main page). Shown below this section is what my entry looks like after I completed the updates. You need one entry with a blank "Initial" column. If you've registered with a gateway in the past, that will already be there. Click the check-box on the left of the 1st line. Enter a blank (press the space bar) in the Initial box. Do NOT click the RPT box. Enter your callsign in the pcname box. Create a 2nd terminal with "initial" C if your hotspot will be on 2 meters, or B if on 70cm. Click on the check-box on the left of the next line. In the Initial box, enter a B or C.
Enter a unique pcname, for example <callsign>-b or <callsign>-c. Here is an example of having entered several terminals. For simplex Hotspots, the "R" terminal isn't needed. The following is done on the computer the Hotspot board will be connected to and where the DVAR Hot Spot or WinDV software will run. If possible, choose a computer with USB 2.0 ports. If your computer has only USB 3.0 ports, either get a powered USB 2.0 hub, or use another computer with USB 2.0 ports. Double-click on the winusb.zip file and select Extract all files. Let it extract to the default, which is a new winusb directory under where the zip is located. Under Drivers and Tools, click on the latest version of NAtools for Windows (32-bit). Save it to a folder of your choice (write the name down). The saved file is a .exe file. Windows 8 users: click here for how to install. All other Windows users, choose a COMPLETE install. If you try to run NAWinCFG or NAWinTEST and get an error message about "RICHTX32.OCX" missing, install it by following these instructions. Set the jumpers on your board. SW1 jumper on MHS board should be DOWN -- looking down at board with connectors to right (USB powered). SW2 jumper should be ON or bridged to adjacent pin. (Temporary for loading the firmware). SW3 should be ON or connected to adjacent pin (Version 5 mode). SW4 should be RIGHT (Version 5 mode). Install firmware if needed. NOTE: Some boards come with firmware installed. Others include the license, but you need to download and install the firmware yourself. Skip this step if your board already has firmware installed. If you don't have a license, go to http://www.dutch-star.eu, log on and purchase firmware. Follow instructions. When 2nd email is received, get the serial number and add that to the http://www.dutch-star.eu license page. Download the firmware to the folder where NATools is located, e.g. c:/Program Files/NATools/BIN (note: may be different for Vista and Windows 7 users). The firmware file will be called node-<callsign>.hex, e.g. node-K6JM.hex. Place the board into "Program" or bootloader mode. This varies by board. For the Star*Board, move the jumper from SW3 to the Program jumper. Use the board layout diagram on the back of the Star*Board manual to find SW3 and the Program pins. Plug in USB cable to connect board to PC. USB Hubs may cause problems -- plug directly into your PC's USB 2.0 port. Start NAWinCFG. It will say "Node Adapter not detected". This is normal when in bootloader mode. Ignore this message and continue. Under the Tools menu, select Update Firmware. 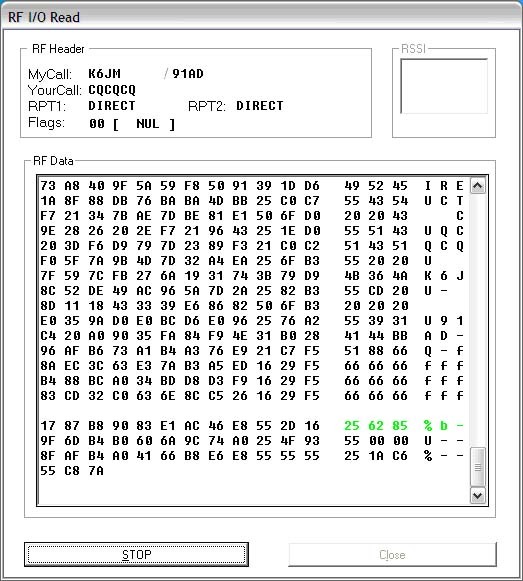 Click Browse and select the .hex firmware file. On the Update Firmware window, click the "Update EEprom data" box -- this is normally done only the first time and is important. Click Update. When done, the Status message should say "Update Succeeded!". Click Close. Remove the program jumper (and place it on it's normal jumper, as appropriate). It's helpful to read the Dutch-Star Hot Spot manual, section 4. Connect the board to the radio with appropriate cable. Using USB cable, connect board to PC. Depending on the version of your board, there may be a green LED lit indicating the board is powered up. If this is the first time a board with DUTCH*Star firmware has been plugged into this PC, Windows will see the new hardware and configure the driver installed back in Step 2 when you did a complete install of NATools. Set the analog radio for simplex mode on an appropriate frequency. Set power to lowest setting. You may want to set Delay Time to 250 or 300 milliseconds. I recommend you disable AutoPolarity, then find the correct Inverts settings so the firmware doesn't try to make that decision each time. Click on Mode. The following settings are suggested. Do NOT check COS Check, which means the firmware will operate in SoftCOS mode (normally the best way of knowing when a valid D-Star signal is being received). 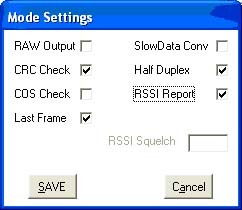 DUTCH*Star MHS - The new MHS board default to V5 mode, so check the RSSI Report box. Turn on your DStar radio. Set to DV mode to same simplex frequency as the analog radio. If the RF Header section is not filled in, you may have to try RX Invert in NAWinCFG. If RF Header info is being received, the line after the occasional blank line should display in green most of the time. Adjust the RX pot on the MHS board if the RF Header or the data after blank lines is not green. Click Stop, then Close. Click Echo Test, then Start. Transmit on your DStar radio. 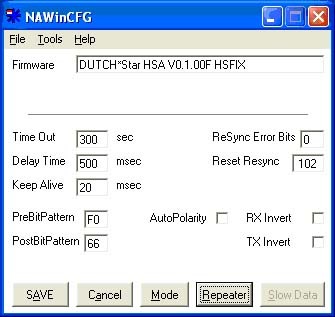 When you stop transmitting, the NAWinTEST software will transmit your callsign, then a welcome message (defaults to PA4YBR's recorded message), followed by your just-recorded voice played back. If the RF Header information, or the echo test does not sound correct, adjust the TX pot on the MHS board. If your D-Star radio can decode nothing, not even garbled audio, then go back to NAWinCFG and toggle the TX Invert setting, Save and try EchoTest again and re-do step 8 and adjust the TX trimpot. If you have a NQSMHS V2 board, you may find the TX audio level is too low. To fix, Mark G7LTT offers this solution: "simply clip the right hand leg of the TX pot (with sockets facing right) and your TX drive will be restored." When all is working, click Stop, then Close, then on the main window, click Close again. 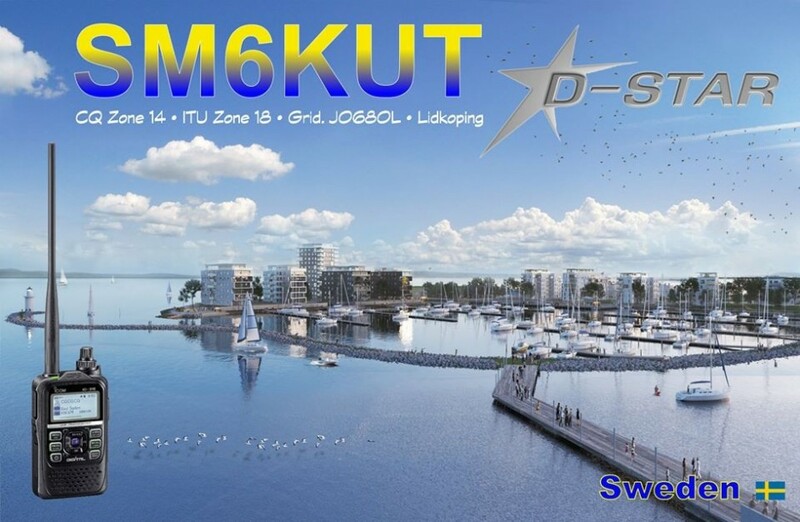 DVAR Hot Spot by Mark McGregor, KB9KHM. This supports linking to D-Plus repeaters and reflectors. It's easy to set up and very stable. Click here for how to install and configure DVAR. WinDV (also known as DV Node for Windows) by Fred van Kempen, PA4YBR. This is a full-featured Windows application. It supports several linking protocols (D-Plus, D-Extra and DCS). You can optionally configure an ircDDB gateway that supports callsign routing. WinDV also supports DTMS tones for controlling linking and other functions over RF. Click here for how to install and configure WinDV. DStarRepeater and ircDDBGateway by Jonathan Naylor, G4KLX. These Open Source programs are provided as Windows install packages, or as source for complilation to the Linux distro of your choice. Together, these programs are full-featured and have become very popular. They run very well on very inexpensive PC hardware, including the $35 Raspberry Pi under Linux. Click here for how to install and configure G4KLX on the Raspberry Pi. Note: I plan to add additional details for installing and configuring WinDV and the G4KLX programs. Please check back here later. This completes setup and configuration. Enjoy! Copyright © 2009-2014 James M. Moen. All rights reserved. If your repeater will be located at a high-RF location, for example on a commercial repeater tower, an inexpensive duplexer will not work for you. You will need a high quality duplexer with 100 db or more isolation and possibly other equipment. You can get lots of info from the internet, such asRepeater-Builder website. Software -- you have a choice, but for this page I'll assume you will use DVAR Hot Spot by Mark McGregor KB9KHM. You can get his software fromhttp://www.dutch-star.eu/software/ -- scroll down to DVAR HotSpot and select the latest version. If you haven't already, refer to Step 5 on Building a D-Star Compatible Hotspot. MoenComm is a distributor of products for Digital Amateur Radio located in Northern California, USA. Our focus is on digital voice products compatible with D-STAR*. Our goal is to provide superb customer service -- ordering, rapid shipping and great customer support. We'll do our best to keep our products in stock for immediate shipment. No more paying for a product, then waiting and waiting to receive it. Our main product is a DV Modem, also called a GMSK Node Adapter or GMSK Modem, used by amateur radio operators to build a D-Star compatible Hotspot or full duplex repeater. For a Hotspot, all you need is this small board, an analog transceiver and a PC with internet. It works, and we are now shipping! Matrix Circuits offers printed circuit board Design, Assembly and Test services at their location in New London, Iowa, USA. 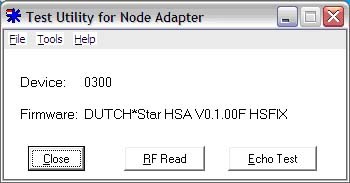 Their Star*Board(tm) comes with a verifiable, supported license for the well-known DUTCH*Star firmware and support tools. This board is small! Only 15mm (H) x 67mm (W) x 51mm (L) -- .6" x 2.64" x 2.01"
This GMSK Node Adapter can be used to create a D-Star Compatible Hotspot or even a low-cost full duplex D-Star compatible repeater. It's fun and easy. Let's say you have a D-Star radio, but you don't have perfect access to your closest D-Star repeater. 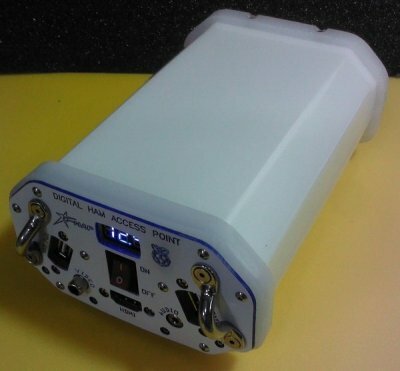 A Hotspot at your QTH allows your D-Star radio to access connected repeaters and/or reflectors worldwide using any analog radio that has a high speed data/packet port, this GMSK Modem, a PC and an internet connection. See Building a D-Star Compatible Hotspot for more information. When your board arrives, also check Recommended Jumpers and Firmware Settings. This board uses a 3' standard "GMSK cable," with a 9-pin DSub connector to the board, and a 6 pin Mini DIN connector for most ham transceivers with a 9600 Data jack. We have these in stock at a good price, or you can build your own - click here. We also offer different length USB Type A to Type B cables, to connect your Star*Board to your PC. Note: Larry WW6USA, a long time D-Star guy, found that the Star*Board fits in an Altoids tin. As many of you know, this little box is often used by QRP homebrewers as an enclosure for their projects. Copyright © 2011-2014 MoenComm LLC & James M. Moen. All rights reserved. A Hot-Spot is a radio station which allows access to a network, well known from WLAN technologies. D-Star uses repeaters which are linked via the internet. This hot spot board is also connected to the internet (via a PC) and cann access any D-Star Repeater running the d-plus software (which are most of them). On the other side the hot spot is connected to a transceivers which must have a 9k6 connector. When the linked D-Star repeater transmits voice, then this digital voice is also transferred through the internet to the hot spot. The hot spot sends this signal to the transceiver which transmits it on any legal simplex frequency. Using a usual D-Star radio (i.e. the IE91 or others) we can hear this transmission. This is very interesting if a station wants to speak on a D-Star repeater which is out of range for direct qsos. This makes the hot spot ideal for areas without D-Star repeaters. I'm using the hot spot primarily for QSOs at home with the IE-91. I can only access a D-Star repeater with very big antennas. There is no chance to use a hand held transceiver. The hot spot solves this problem. Simple write an e-mail to Satoshi with an order for boards and you will receive the boards in a very short time for a good price. You will also receive a special internet page showing all required information to build the hot spot. Additionally you need the PC software which talks to the board and links it to a D-Star Repeater. This software was written by Mark, KB9KHM and is avialable for download in the yahoo group: gmsk_dv_node. This is the component side of the hot spot board. The big chip on the left is the CMX589A GMSK modem chip. It is available from electronic distributors. In Germany I got it from SE-Elektronik. I have connected the hot spot board to an old Standard C5608 transceiver which was extended with a 9k6 access (see this link). This is the solder side. You can see the additional 100 nF (SMD) capacitor. I built the hot spot board into a metal case. This is important since the board radiates on the crystal frequencies and harmonics. I always use chich plugs for all signals. This makes it very flexible if I want to connect the devices in different ways without the need of soldering cables. Here it is, ready and fully operational together with the Standard C-5608. 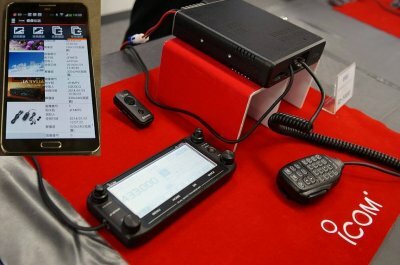 D-STAR stands for Digital Smart Technology for Amateur Radio. 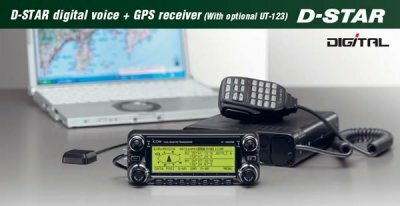 The purpose of D-STAR is to allowHAM Radio operators to speak further and clearer using digital voice while sending data from 1200BPS on up at the same time. The D-STAR system covers communications on HF, VHF, and UHFradio bands while defining interfaces for both radios, repeaters, Internet interconections, and PC interfaces. According to Icom America: D-STAR transfers both voice and data via digital encoding over the 2 m (VHF), 70 cm (UHF), and 23 cm (1.2 GHz) amateur radio bands. Voice is encoded as a 3600 bit/s data stream using AMBE* encoding. Data streams are sent at 9600 bit/s over the 2 m and 70 cm bands and at 128k bps over the 23 cm band. Radios providng data service use a RS-232 or USB connection for low speed data and Ethernet for high speed connections to allow easy interfacing with computer equipment. *NOTE: AMBE is an acronym for "Advanced Multi-Band Excitation": A speech coding standard developed by Digital Voice Systems, Inc. It is used by the Inmarsat and Iridium satellite telephony systems, certain channels on XM Satellite Radio,G4GUO protocol for high frequency amateur radio and is the vocoder for OpenSky Trunked Radio Systems. ARE YOU D-STAR READY? CLICK THE D-STAR READY ICON BELOW FOR D-STAR CALL SIGN REGISTRATION SO YOU CAN BE D-STAR READY TOO! 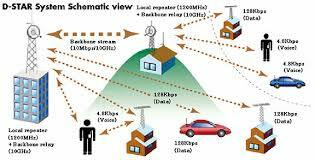 Air Link: The portion of data transmission that takes place as a radio signal. The D-STAR air link includes both modulation methods and data packet construction. Area: The geographical region served by one D-STAR repeater. Authorization: Adding a user to the D-STAR registry. 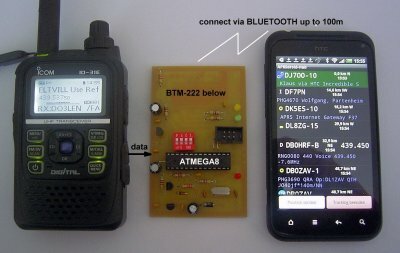 Bridge: A connection between just two devices, such as between two ID-1 transceivers. Client: A program that requests data (programs, Web pages, documents, etc.) from servers. Codec: Code/Decode, a circuit or program that translates an analog signal to and from digital form, usually refers to an audio signal, such as voice or music. Different codecs, such as AMBE or MP3, have different rules for the translation between analog and digital. Controller: The part of a D-STAR repeater that handles and routes the voice and data streams either between modules or between modules and the gateway. DD (Digital Data): The D-STAR high-speed digital data signal. DV (Digital Voice): The D-STAR digital voice + low-speed data signal. EchoLink®: (www.echolink.org/) and IRLP (Internet Relay Linking Project -www.irlp.net/ systems that allow repeaters to share digitized voice signals using Voice-Over-Internet Protocol (VOIP) technology. Encapsulate: To incorporate data packets from one protocol inside the data packets of another. Ethernet: The set of protocols that control local area network (LAN) connections, described by the IEEE 802.3 standard. FEC: Forward Error Correction, the process of adding information to data so that the receiver can correct errors caused by the transmission process. Gateway: The part of a D-STAR repeater that connects the controller to other gateways via the Internet. IP: Internet Protocol, the protocol that controls how data packets are exchanged on the Internet. IMBE: (Improved Multi Band Excitation) is a proprietary vocoder developed by Digital Voice Systems, Inc. (DVSI). Module: A D-STAR module is the part of a D-STAR repeater that implements voice or data communication over the air. Register: Capture the call sign of a received signal and post it to the system registry for other D-STAR repeaters to use for the purposes of routing calls. Registry: A shared data base of authorized user call signs and gateways. Route: To direct data packets to specific destinations. Server: A computer that supplies data (programs, Web pages, documents, etc.) to clients when requested. vocoder: (name derived from voice encoder, formerly also called voder) is aspeech analyzer and synthesizer. It was originally developed as a speech coder fortelecommunications applications in the1930s, the idea being to code speech for transmission. Its primary use in this fashion is for secure radio communication, where voice has to be digitized, encrypted and then transmitted on a narrow, voice-bandwidth channel. The vocoder has also been used extensively as an electronic musical instrument. Zone: A group of D-STAR repeaters linked together and connected to other D-STAR systems by a single gateway. It was back in late August 2006 that Bob Randall, KE6YRU, first introduced his digital UHF repeater to the San Diego amateur radio community. That first repeater consisted of two ID-800H dual-band mobiles and an analog repeater controller set up on his coordinated frequency pair. While it was modest at best, it did give us a taste of what digital communications can bring to us. That first repeater renewed interest in digital communications, and Bob made presentations to various clubs in the area to demonstrate his repeater. Those first steps were significant because it laid the foundation for what has now become the D-Star San Diego Group. This group, consisting of a Bob and a few local area amateur radio operators, made the investment in what promises to be a first for San Diego amateur radio. That two-mobile repeater has been replaced with a full-blown D-Star repeater, intergrating digital voice and digital data on that UHF frequency pair. Soon to follow are digital repeaters on 2 meters as well as 1.2GHz. In October of 2007, Bob moved from San Diego, CA to Indianapolis, IN. Instead of taking his repeater with him, he worked a deal with thePAPA SYSTEM to maintain the repeater on Mt. Woodson. The new ownership was a tremendous boost for D-Star in San Diego as Mt. Woodson now becomes an integral part of the PAPA SYSTEM's D-Star line-up, covering southern California with 6 D-Star repeaters (now 3 in San Diego County). The Mt. Woodson D-Star repeater was be the first in San Diego with access to the D-Star Gateway, ushering in a whole new chapter in San Diego D-Star History.Soon to follow was the Palomar Mountain D-Star repeater, also with gateway access, and finally the Mt. Otay D-Star repeater (no gateway at this time). The frequency for the Mt Woodson D-Star repeater is 447.840 (-) and the call is KI6KQU B. The frequency for the Palomar Mountain D-Star Repeater is 445.860 (-) and the call is KI6MGN B. The frequency for the Mt. Otay D-Star Repeater is 446.980 (-) and the call is KW6HRO B. Hope to hear you on the Mt. Woodson KI6KQU B D-Star repeater! 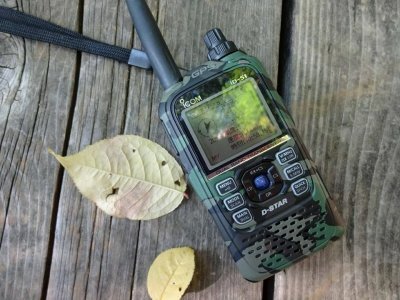 The Icom IC-92AD is a rugged 5 watt dualband HT with D-STAR built-in! Three RF power levels are available. It is built military tough and is submersible (1 meter 30 minutes). The 92AD features a multi-line display andkeypad entry. Connect the optional HM-175GPS speaker mic to transmit position data - perfect for SAR. These programs, written by Pete Loveall (AE5PL), allow D-STAR users to use their radios as APRS trackers. The DstarInterface converts received D-STAR GPS position reports to the APRS format and sends them to the APRS-IS. DstarTNC2 lets you use an APRS-IS enabled client, like UI-View or Xastir, with the GPS position reporting feature of D-STAR radios. DstarInterface is an adjunct of thejavAPRSSrvr and DstarTNC2 can be downloaded at http://www.aprs-is.net/dstartnc2.htm. The digital GM function automatically checks whether members registered in a group are within communication range, and displays information such as distance and direction for each call sign on the screen. This convenientfunction makes it possible not only to see whether any friends are in communication range, but also to instantaneously determines the location and relationship between all members of the group. The FT-2DR operates in one traditional analog mode and three digitalmodes! Enjoy communication in the mode that best suits your needs. purpose. Half of the bandwidth is used for voice signal with error correction. The transceiver uses powerful error correction technology developed for professional communication devices. The very effective error correctioncode provides benefits such as minimal interruption of communication. The basic digital C4FM FDMA mode provides a good balance between sound quality and error correction.